It’s important to take any and all “based on true events” stories with several grains of salt, especially when there’s clearly an agenda on the part of the filmmaker – be it political action or just to earn himself an Academy Award. Ryan Coogler, a first time director, most likely has the best of intentions with his debut film, and I’m willing to give him the benefit of the doubt that monetary gain and accolades were not his only or even his primary concerns. That being said, in order to create a compelling story and film, he has the incentive to take creative license with his subject matter, and, truth be told, I do not necessarily hold that against him, either. Sometimes, the facts just do not make for good cinema, and it is my opinion that we must always keep that in mind when taking in these kinds of films. 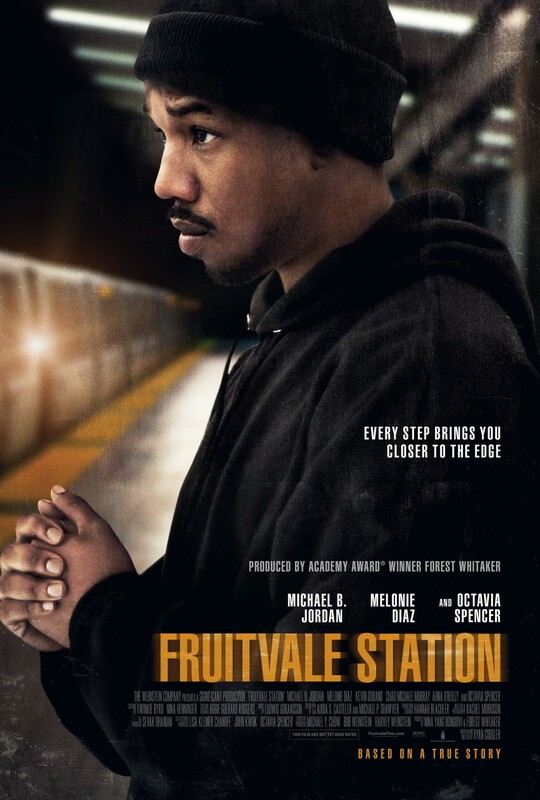 Fruitvale Station is based on the final day in the life of Oscar Grant III, a young black man from Oakland, California who was shot and killed by an arresting police officer, despite Oscar being on the ground and handcuffed. The film opens with a disturbing phone recording of the event, taken on New Year’s Day 2009 at the station that lends its name to the film, clearly showing the officer pulling a gun out and shooting Oscar point blank with no justification. The officer was charged with murder, only to be convicted of involuntary manslaughter. The event sparked riots and protests and accusations of racism on the part of the arresting officers. Coogler’s account of Oscar’s final day does not shy away from showing Oscar as anything but flawed, having cheated on his girlfriend, the mother of his daughter, and struggling to find a job after having been fired for his irresponsibility. Oscar is shown struggling with thoughts of drug dealing as a means of supporting his family, and the film flashes back to a time when his mother nearly lost faith in him to turn his life around, as well. It also shows him to be someone who was also loved by his family, including his mother, who, despite her own struggles with him, always hoped he would turn around. He’s admired by his daughter and, despite his cheating, is also loved by his girlfriend. The creative license comes in the form of using Oscar as a sort of symbol for all the young black men out there who many would look down upon based upon their appearance. As many have pointed out, the film’s release so close to the sentencing of George Zimmerman in the death of Trayvon Martin is almost serendipitous, and Oscar, in the film, easily stands in to represent not just the actual man this story is based on, but for anyone unjustly killed based on their appearance and the color of their skin. 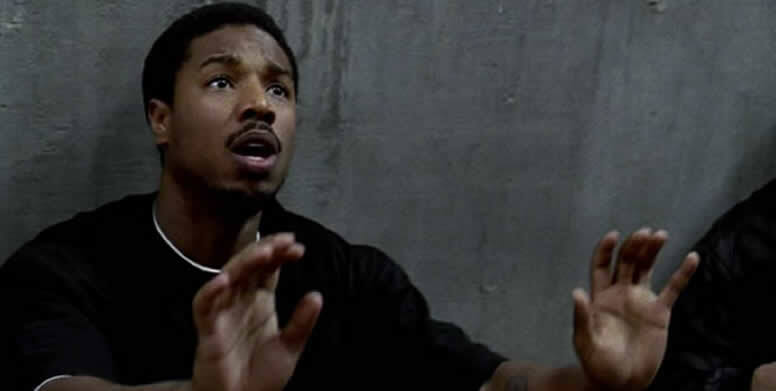 Oscar the man and Oscar the film character are not stated to be perfect people, but Fruitvale Station seems to be more concerned about depicting Oscar the symbol. There is a scene in the middle of the film, completely fictional but absolutely pivotal to the film’s message, where Oscar is shown coming to the aid of a friendly dog who has just been struck by a car. The dog is a pitbull, a breed whose reputation as a dangerous killer by nature has been unjustly become false but common knowledge among the ignorant. It’s a heartbreaking scene, where Oscar is shown to be the only one who cares enough to try to help the discarded creature. Ryan Coogler has stated that his identification with Oscar was his primary motivator in making this film. As a scene purely of his own creation, Coogler basically tells us that there’s as much of himself in the Oscar character as there is the actual Oscar Grant and even Trayvon Martin. Coolger is calling for understanding and help through his depiction of Oscar, and showing the audience that this was a man who, no matter his flaws, could have made a name for himself and made change for the better, possibly even changed the perceptions of others, had he been given a chance. Coogler himself got the opportunity to make this film, but the same cannot be said for Oscar Grant or Trayvon Martin. This message may become garbled, however, depending on whether you believe the defense’s stance that, in the confusion, the officer mistook his pistol for his taser, an understandable but no more justifiable defense that, regardless, led to the officer’s lightened sentencing. Coogler, it is obvious, does not seem to buy into this, and it’s also clear that the film supports the perspective that the officer’s actions were motivated out of racial prejudice. Like Oscar, however, I think that, no matter how unjust the officer’s actions were, the situation is far more complex than that, and I don’t think the film necessarily denies, this either. It’s important to take the film as more of a statement about the tragedy of those subconscious prejudices we may have towards one another while also taking it as a call to reevaluate and work on ourselves to prevent further tragedies like the one that inspired this film. 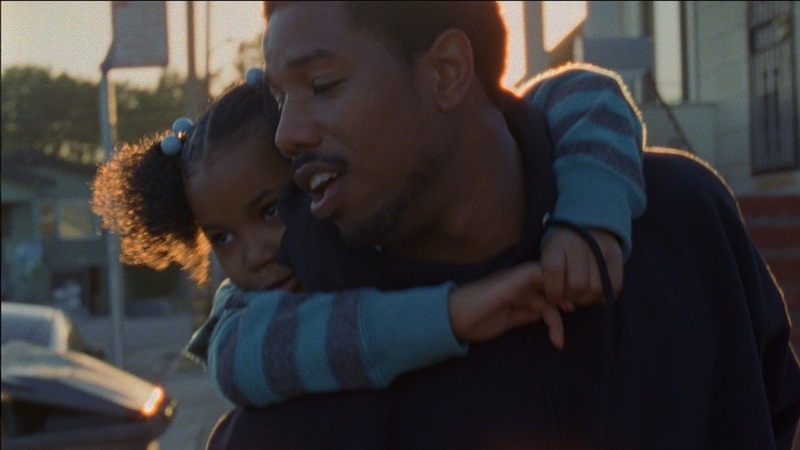 Regardless of your stance, however, there’s no denying the film that Coogler has crafted is moving and effective, with a cast that ably handles the emotional true to life (if not true to actual events) subject matter – star Michael B. Jordan is going to be showing up in a lot of places after this, I assure you. Some might accuse this film of being manipulative, inaccurate, or even deceptive, and while the filmmakers have their acknowledged agenda, I genuinely do believe in the artistic integrity and validity of what Coogler was trying to present, regardless of any of its flaws.